Georges Bingen was born in Luxembourg in 1957, graduated in economics and has an MA in econometrics. Between 1981 and 1985, Georges was a Research Fellow at the Free University of Brussels (UBL) and also at the European Commission's Joint Research Centre in Italy. In 1986, he became a Consultant for Directorate-General for Energy at the European Commission. 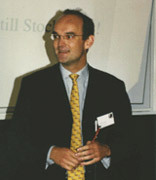 From 1987 to 1994, Georges worked as an Economic Advisor in the Central Statistical and Economic Study Department at the Ministry of Economic Affairs, Luxembourg. Between 1994 and 1999, Georges worked again for the European Commission, as a Scientific Officer at Directorate-General for Research. In June 2000, he became Head of Unit for Marie Curie Fellowships (Improving Human Potential Programme) at Directorate-General for Research. Since July 2004, Georges has been working as Head of Unit for Strategy and Policy (Human factor, mobility and Marie Curie Activities) at Directorate-General for Research, European Commission. Vladimir Demidyuk was born in Rovno, Ukraine, in 1964. He received the M.S. and Ph.D. degrees in physical chemistry from Moscow State University, Russia and became an Associate Professor at that University. Then he worked as a Visiting Researcher at Inha University, Inchon, Korea (2000-2005). He won Marie Curie Incoming International Fellowship in 2005 and at present time he is a Senior Research Fellow at the University of Manchester. His research interests are heterogeneous catalysis and the application of plasma and photocatalysis to environmental pollution control. Curtis Dobson spent ten years working at the University of Manchester on the role of environmental agents including viruses in neurodegenerative disease. During that time he discovered a human protein region with direct and broad anti-infective activity, and developed a range of compounds relating to this region for use as anti-infective agents. Later generations of the compounds have ten-fold increased activity against HIV, and act through a novel mechanism, representing a fifth approach to HIV therapy. Other compounds within these families have bacteriolytic and bacteriostatic activity against organisms associated with infection related to medical devices, and are suitable for use as novel and safe prophylactic coatings. Dr Dobson has driven the commercialization of these technologies, and in 2004 established a new company - Ai2 Ltd – to take this forward. 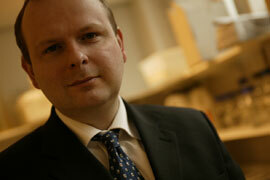 Dr Dobson is currently Ai2's Director, though he retains an academic role within the University. The company has received appreciable investment, which has driven the expansion of its patent portfolio, and enabled proof of principle programmes to be carried out in key application areas in partnership with blue chip companies, and other SMEs. Dr Dobson's work was voted North West Biotechnology Project of the Year for 2004, and Ai2 judged North West Biotechnology Start-up of the Year for 2005. 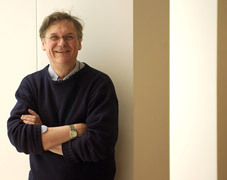 Tim Hunt is a Principal Scientist at Cancer Research UK, Clare Hall Laboratories, in South Mimms, Herts (15 miles north of central London). Dr Hunt was born in 1943 and lived in Oxford until he was 18 years old and went up to Cambridge to read Natural Sciences. He did his Ph.D. in the Department of Biochemistry entitled "The Synthesis of Haemoglobin". He spent almost 30 years altogether in Cambridge, mostly working on the control of protein synthesis, with spells in the USA; he was a postdoctoral Fellow at the Albert Einstein College of Medicine in 1968-70 and he spent summers at the Marine Biological Laboratory, Woods Hole from 1977 until 1985, both teaching and doing research. In 1982, he discovered cyclins, which turned out to be "Key Regulator(s) of the Cell Cycle", and led to a share of the Nobel Prize in Physiology or Medicine in 2001 together with Lee Hartwell and Paul Nurse. Dr Hunt has helped write two books: together with Andrew Murray, he wrote "The Cell Cycle: An Introduction", and with John Wilson composed "Molecular Biology of the Cell: A Problems Approach" to accompany the textbook by Alberts et al. The Problems are now in their 3rd edition. Apart from researching, writing and lecturing, Dr Hunt finds himself on several advisory panels. He was a member of the EMBO panel that reviewed Cell and Molecular Biology in Austria and chaired the EMBO review panel for the French "Genopole" system. He was on the Scientific Advisory Board of the IMP in Vienna, and is a member of the advisory board of laboratories in Cambridge, Dundee, Edinburgh, London, Madrid, Mishima, Oxford and Trieste. He chaired the Life Sciences Panel for selection of European Young Investigators under the aegis of the European Science Foundation, and is chairman of the council of EMBO. He actively promotes the idea of a European Research Council by lobbying commissioners and MPs in Brussels. Dr Hunt is a Fellow of the Royal Society, a Fellow of the Academy of Medical Sciences, a Foreign Associate of the National Academy of Sciences of the USA, a Member of EMBO, a Foreign Member of the American Academy of Arts and Sciences and a Member of Academia Europaea. He is married to Mary Collins, who is Professor of Infection and Immunity at University College London. They have two children, Celia (11) and Agnes (7). Raffaele Liberali was born and educated in Rome, where he obtained a Masters degree in Mechanical Engineering. After different experiences in industry, he joined the European Commission in 1978, where he first worked as a Scientific Officer in Directorate-General for Energy. He subsequently took up position as Assistant to the Director-General for Credit and Investments, becoming Head of Unit for Studies and new financial techniques within the same Directorate-General in 1989. He then spent five years as Head of Unit in Directorate-General for Personnel and Administration. In 1996 he moved to Directorate-General for Research as Director for Administrative and Financial Affairs. He has been Director for The Human Factor, Mobility and Marie Curie activities within Directorate-General for Research since 2001. Steve Miller trained in physical chemistry at the University of Southampton, where he obtained a BSc. and PhD. After several years postdoctoral reseach, he worked during the early 1980s as a political journalist for the Labour Party in London. The abolition of the Greater London Council and other changes left him in need of a job, and he went back into science. He joined University College London in 1986 as a researcher in molecular spectroscopy and – later - astronomy. Prof. Miller is engaged in research on public understanding of science (PUS), particularly the European dimension of this field. His recent work includes the directing the European Network of Science Communication Teachers (ENSCOT) and its current successor ESConet Workshops, and chairing the European Commission’s Expert Group Benchmarking the Promotion of RTD Culture and Public Understanding of Science. He is also interested in the popularisation of the physical sciences. In planetary sciences, Prof. Miller runs a research group investigating the atmospheres of the giant planets and extra-solar planets. He now chairs the Solar System Advisory Panel of the Particle Physics and Astronomy Research Council, and is part of a team advising the Royal Observatory Greenwich on its new Astronomy and Space Science Galleries. Nathalie Moncel is a doctor in economics and works currently as a senior researcher at CEREQ, a French public research institute on training and employment. She was a Marie Curie post-doctoral fellow at CRIC in the University of Manchester in 2001, and at EWERC, Manchester School of Management-UMIST in 2002. She studies more particularly employment systems and youth integration into work. Her recent work dealt with young workers in the car industry in three European countries; another major project was developed in the frame of an FP5 European network on employees' resources and social rights (RESORE) and compared labour market and social policies across eight European countries. Professor Dame Nancy Rothwell FRS, Vice-President for Research and MRC Research Professor of Physiology at the University of Manchester. 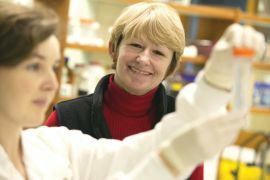 Her current research is on the mechanisms of and development of treatments for brain disease such as stroke and Alzheimer's, and spans molecular, cellular and whole animal biology and clinical studies. Nancy has a strong and active interest in public communication of science and gives many talks and media presentations, in 1998, she delivered the Royal Institution Christmas Lectures. She was elected a Fellow of the Royal Society in 2004 and won the prestigious Pfizer European Research Prize in 2003. She is a trustee of NESTA, Cancer Research UK and The Coalition for Medical Progress, Chair of the Research Defence Society and the National Centre for 3Rs funding panel, a current Council member of BBSRC and the Academy of Medical Sciences and a recent Council member of MRC and president of the British Neuroscience Association. In June 2005 she was made Dame Commander of the Order of the British Empire.